Who will ever forget Helicopter Sunday. Last game of the season 2005 the Gers went into the final game at Easter Road against Hibs, two points behind Celtic, but a sensational late fightback by Motherwell against Celtic at Fir Park meant Rangers 1-0 win against Hibs gave them the title . Celtic went 1-0 up through Chris Sutton in 29th minute, the helicopter with the Scottish League trophy is flying towards Fir Park. Then drama ..... Motherwell equalise with 2 minutes to go - Rangers are now Champions, but Celtic still have time to score, helicopter now in hover mode ! 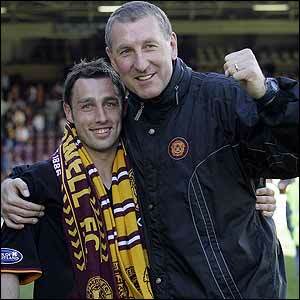 Then unbelievably in injury time Motherwell's Scot McDonald scores a second goal. Helicopter diverted and sent to Easter Road !!! Rangers are the Champions. 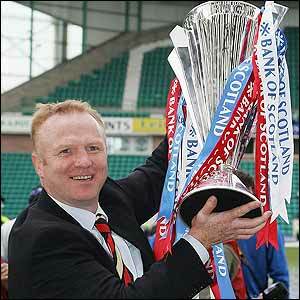 Despair for Celtic and Martin O'Neil, joyous celebrations for Rangers and Alex McLeish. helicopter diverted from Fir Park ...... tae Easter Rd. Douglas, Agathe, Balde, Varga, McNamara, Petrov, Lennon, Sutton, Thompson, Hartson (Beattie 75), Bellamy. Subs Not Used: Valgaeren, Lambert, Laursen, Marshall, Maloney, McGeady. Marshall, Corrigan, Craigan, Kinniburgh, Fagan, Foran, Kerr, Fitzpatrick (Clarkson 88), Paterson, Scott McDonald, Hamilton (Britton 85). Waterreus, Ricksen, Andrews, Kyrgiakos, Ball, Arveladze, Ferguson, Alex Rae, Buffel, Prso, Novo. Simon Brown, Whittaker, Caldwell, Smith, Ian Murray, Sproule (Shiels 65), Scott Brown, Beuzelin (Antonio Murray 74), Glass, O'Connor (Konte 68), Riordan. We were two points behind Celtic with one game to play. We've won the league again, fly the flag, fly the flag." Don't write off the Rangers, we never surrender. The waiting was over, it was judgement day. We packed ourselves into the Easter Road stands. A wave of excitement swept over the fans. Sutton had scored, for 2nd place we were heading. We looked to the heavens and prayed for a hero. Not one of our loyal fans had departed. Buffel to Novo who made no mistake. Our attentions now turned to events at Fir Park. They sang Championees and the Fields of Athenry. For theirs is a club which is destined to fail. Douglas is nowhere and Timmy is sick. But there was no solace there for their tear-stained eyes. But it sure wasn't landing, it was turning around. Astonishingly brilliant, I think bloody not! The players on the pitch knew that Motherwell had scored. Tension gripped all of the red, white & blues. Another eruption at our end of the ground. MacDonald again, not bad for a Tim. This time it was landing with the SPL prize. Come over to our place, we're having a party. " A sea of red, white & blue had amassed. The team bus arrived and the place came alive. A reward for a season of courage and fight. As we find ourselves now in more difficult times. But unite on a Saturday and get behind the team. Think back to the day when the sun shone on Leith. We'll always remember that Sunday in May. Let the others come after us, we welcome the chase.